PandaTip: While filling out tokens customizes most of this proposal template immediately, it’s a good idea to personalize the content on each page. Start by adding a bit more detail to the introduction. PandaTip: Tables are a great way to communicate information in an organized way. This proposal template includes several tables that communicate service schedules, pricing, and insurance coverage in a visually appealing manner. PandaTip: Be sure to customize the coverage table below with your company’s policy limits. Certificates of insurance naming [Client.Organization] as additional insured shall be submitted to [Client.Organization] for approval prior to services being rendered by [Sender.Company]. Each policy listed above shall extend for a period equal to, or longer than the length of the legal binding contract for services listed in this proposal. [Sender.Company] shall be required to submit written notification 30 days prior to cancellation of any of the above listed policies. PandaTip: PandaDoc’s tables include optional line items, editable quantities, and discounts. This pricing table includes a 7% discount on all services, which you can remove using the menu on the right. [Sender.Company] will affix unique identifying barcodes to each vehicle serviced under the terms of this proposal. An invoice will be generated every 30 days for actual services rendered during the previous 30 day period. All invoices will be payable on a net-20 basis via check, credit card, or wire transfer. PandaTip: PandaDoc proposals can be viewed and signed from any computer, smartphone, or tablet. 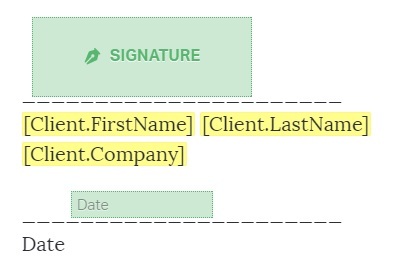 Once you’ve customized this template to your liking, assign the signature and date fields below to your client and send using the button on the right. Signing below indicates [Client.Organization]’s intent to proceed with the proposal outlined above. Upon receipt of a signed proposal, [Sender.Company] will draft and send a legally binding contract.